One of the hardest parts of eating keto for me is the constant having to make meals from scratch. Because my family does not eat keto, I usually end up making the family meal first, and then run out of steam (and energy, and motivation) to make a second meal for myself. So I like to have easy keto freezer meals that I can pull out for my meals, that don’t require a lot of extra cooking. Sometimes it is just a pre-cooked protein, that I can then pair with a sauce or use in a salad. I’ve posted recently about my favorite gluten-free freezer meatballs, and they have worked out so well, I decided to make a keto version of them just for me! These are my Easy Keto Meatballs that you can make in a large batch and freeze to use in later meals, or use them for your weekly meal prep. They are tender and juicy and full of flavor! My favorite way to eat them is baked in a casserole dish, covered with a bit of keto-approved spaghetti or marinara sauce, and smothered in a whole heck of a lot of cheese that is then broiled to bring out a nice golden brown crust! 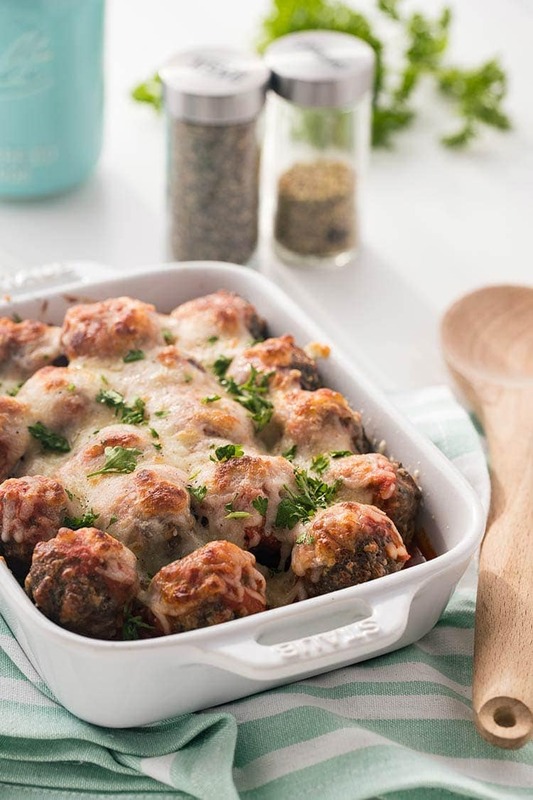 I keep bags of these easy baked meatballs in my freezer and they are SO incredibly handy! 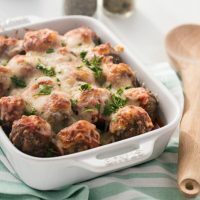 I prefer to use 80/20 lean ground beef here – I feel like it’s a nice balance with enough fat to keep things juicy and flavorful without having the meatballs get too dry. I have tried leaner ground beef before, and it tends to make for drier, tougher meatballs. Since we’re aiming for keto meatballs here, there’s no need to shy away from the fat. But on the other hand, if you get too much fat in there, then you have meatballs that fall apart and drown in a puddles of grease. No bueno. You could absolutely ramp these up a notch and walk on the wild side by going with a half-ground-beef/half-ground-pork mixture, and I think you’d really be on to something. But for this one, I wanted to just keep things simple and stick with plain ground beef. 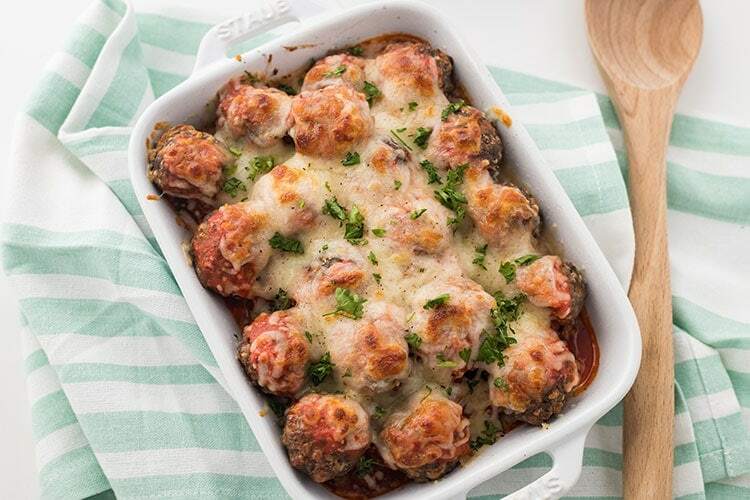 Just like with my Easy Baked Freezer Meatballs, you really want to use a scoop for these! Not only does it speed up making the meatballs, it also makes them all uniform which makes for more even cooking. Take a few minutes, and invest a few dollars into a good quality scoop. You will find you use it for SO many things! I use a medium cookie scoop, usually marked as a a #30 or #40 scoop (they are very close in size, so either will work). For specific recommendations on the scoops I love and use in my kitchen, see my post HERE. And don’t forget to use a silicone baking mat with these – it makes getting them off the tray so much easier, and clean up is a breeze! Especially important since these meatballs use cheese as one of the binders, and it will tend to melt out of the meatball while baking. I generally let the meatballs cool a bit after coming out of the oven, and then scoop them into a gallon ziptop freezer bag that I have labeled. Then into the freezer they go. 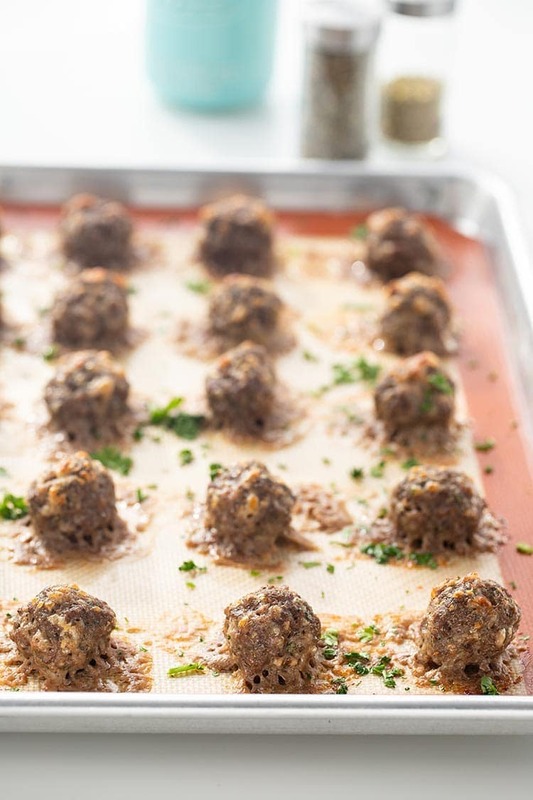 You can flash freeze them if you’d like – just let your tray of keto meatballs cool, and then stick the entire thing, meatballs, tray and all, into the freezer for a couple hours until the meatballs have frozen solid. 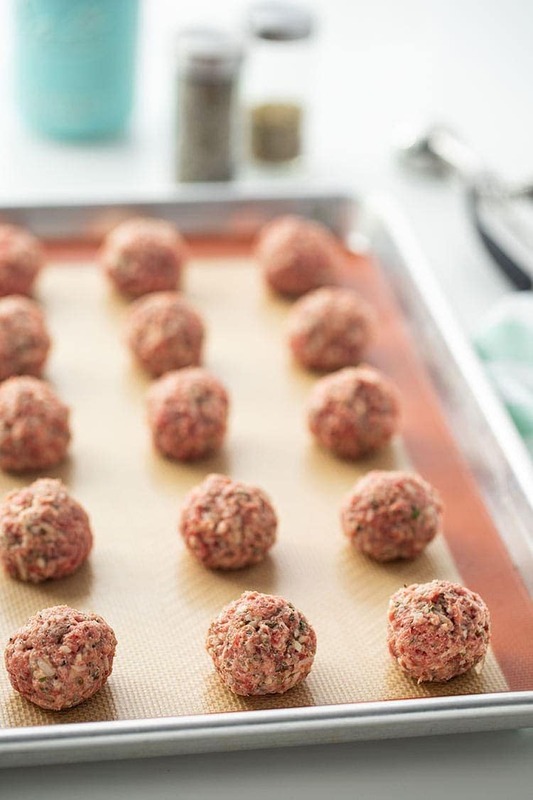 Then remove the tray and meatballs from the freezer, transfer the frozen meatballs into your freezer bag or container of choice, and place them back into the freezer until needed. Your best reheating method will really depend on how you intend to use them. Since I often eat these as my main entree, I pull a bag of frozen keto meatballs out of the freezer and let it thaw in the fridge overnight. Then I place the thawed meatballs into a baking dish, cover with a big of keto-approved spaghetti or marinara sauce, top with cheese, and bake at 350 degrees Fahrenheit for about 20 minutes, then place under the broiler for an additional five minutes to get the cheese all nice and bubbly and brown. Having pre-made frozen meatballs that are low-carb and keto-approved has been such a game changer on nights when I’m tired, or things are busy, or I’m struggling to stay on track. And these easy keto meatballs work great for meal prep, too! Make up a batch and put them in meal prep containers with your favorite sauce and some zoodles or low-carb noodles and you’ve got nearly instant gratification for lunch or dinner throughout the week! Or heck, eat them all as snacks throughout the day – I won’t judge! Simple keto meatballs you can make in advance and freeze to keep on hand for fast keto meal options or easy keto meal prep throughout the week! Combine all ingredients in large bowl and use clean hands to mix. Using a 2-tablespoon cookie scoop (size #30 or #40), portion out a meatball. Roll gently between hands to shape, then place on a baking sheet lined with a silicone mat. Continue portioning out meatballs until all meat mixture has been used. Bake meatballs at 400 degrees Fahrenheit for 25-30 minutes. Place cooled meatballs into gallon-size ziptop freezer bag or freezer container of your choice. Label and date, and place into freezer. My local store carries an Italian-style cheese blend, but if your's does not, you can easily substitute 1 cup of shredded mozzarella and 1 cup of shredded Parmesan cheese for the 2 cups of Italian-style cheese blend in the recipe. Nutrition information is provided as an estimate only.